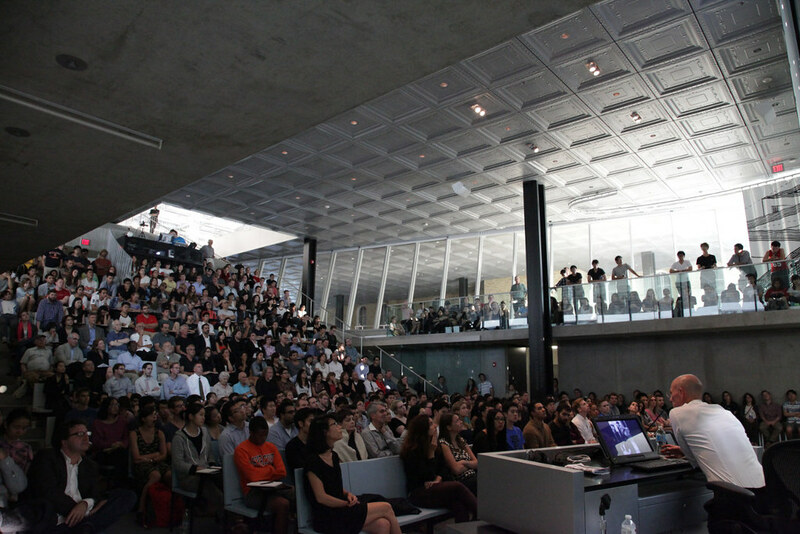 Jacques Herzog, second from left, during the introduction of his keynote address in the Abby and Howard Milstein Auditorium in Milstein Hall. Herzog's keynote address in the auditorium. An overflow crowd attended the Herzog lecture. 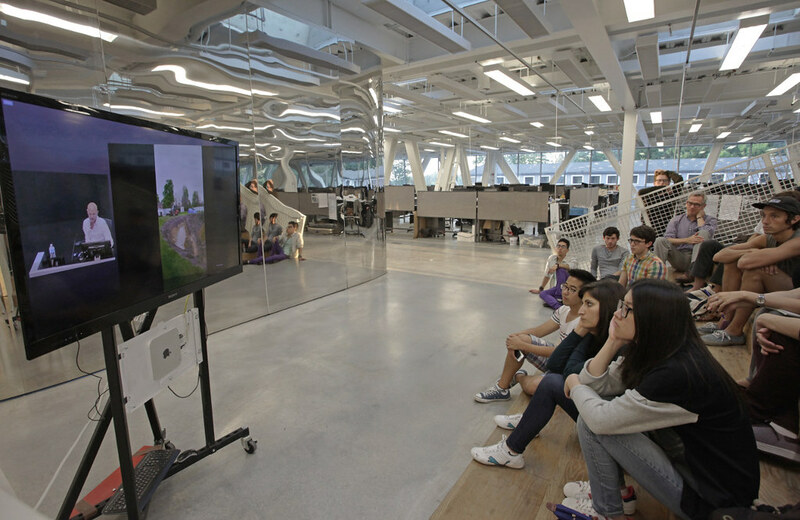 Due to the capacity attendance in Milstein Auditorium, students watched Herzog's lecture in several locations throughout the college, including the Milstein Hall studio plate. Vladimir Pajkic (B.Arch. 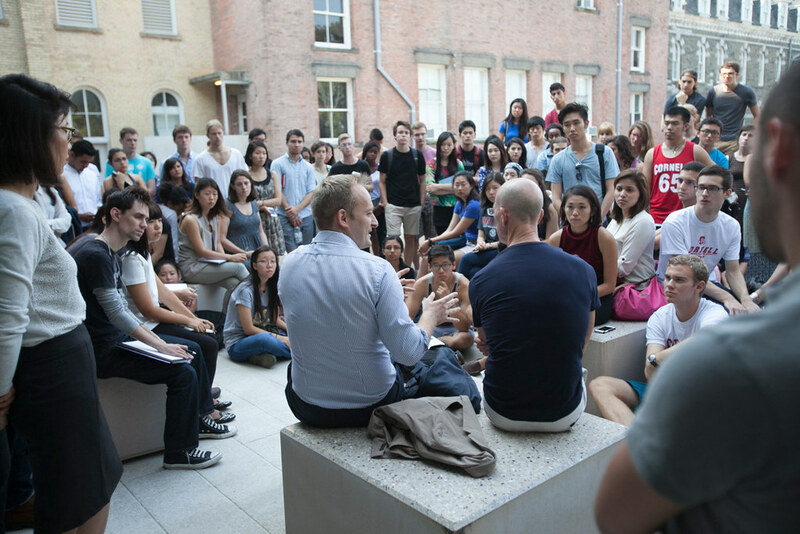 '00), on left, sits with Herzog in conversation with students at the Milstein Hall West Plaza. Students listening during the conversation between Hezog and Pajkic. Herzog makes a point during the gathering on the West Plaza. Herzog responds to student comments. 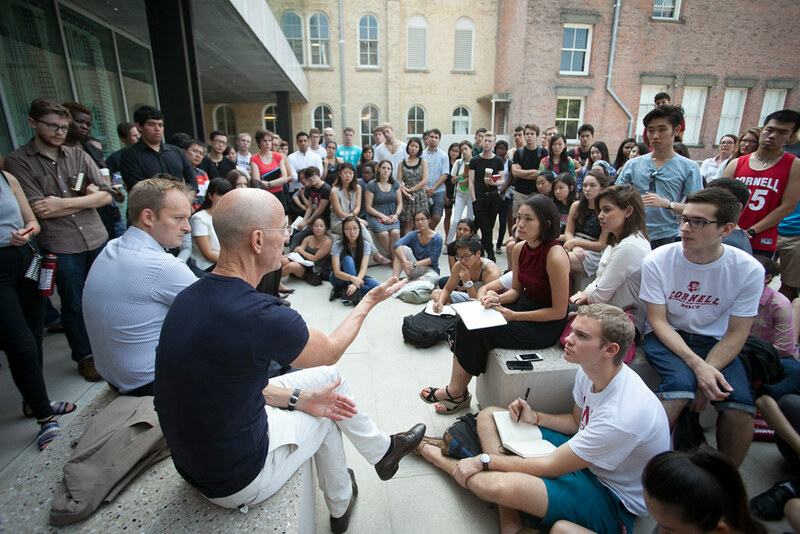 Herzog and Pajkic in conversation with students on Milstein Hall's West Plaza. 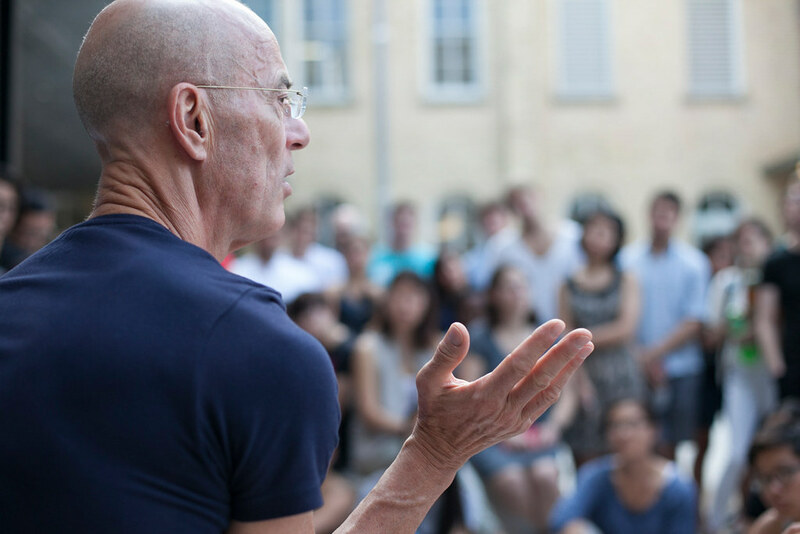 Herzog gesturing during the conversation with students. Peter Eisenman (B.Arch. '55), during the afternoon discussion with Herzog. 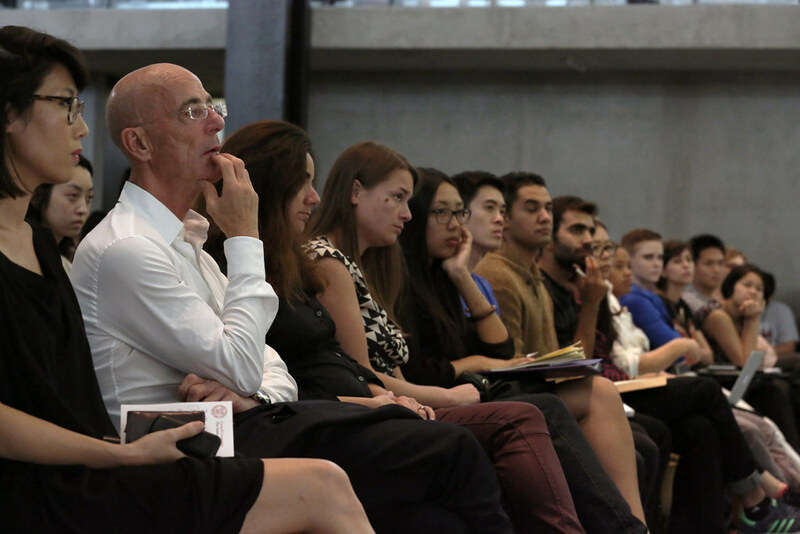 Jacques Herzog, second from left, during the introduction of his keynote address in the Abby and Howard Milstein Auditorium in Milstein Hall. Herzog's keynote address in the auditorium. Herzog's keynote address in the auditorium. An overflow crowd attended the Herzog lecture. 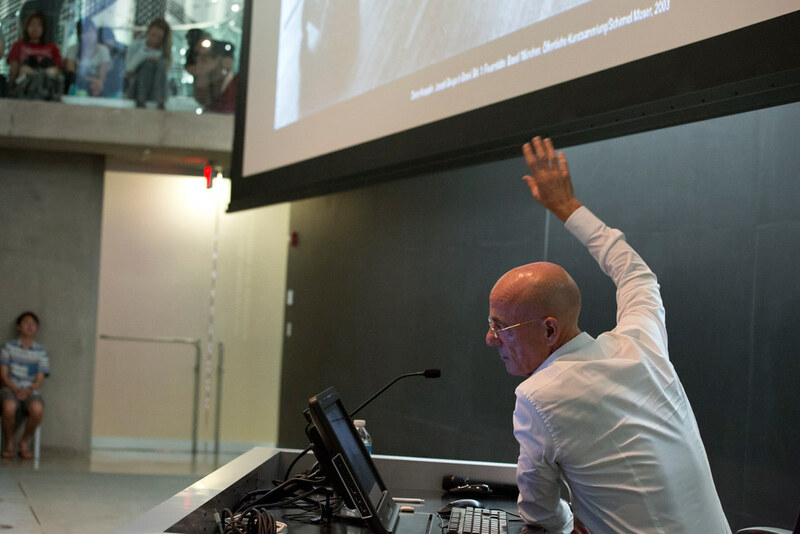 Due to the capacity attendance in Milstein Auditorium, students watched Herzog's lecture in several locations throughout the college, including the Milstein Hall studio plate. Vladimir Pajkic (B.Arch. 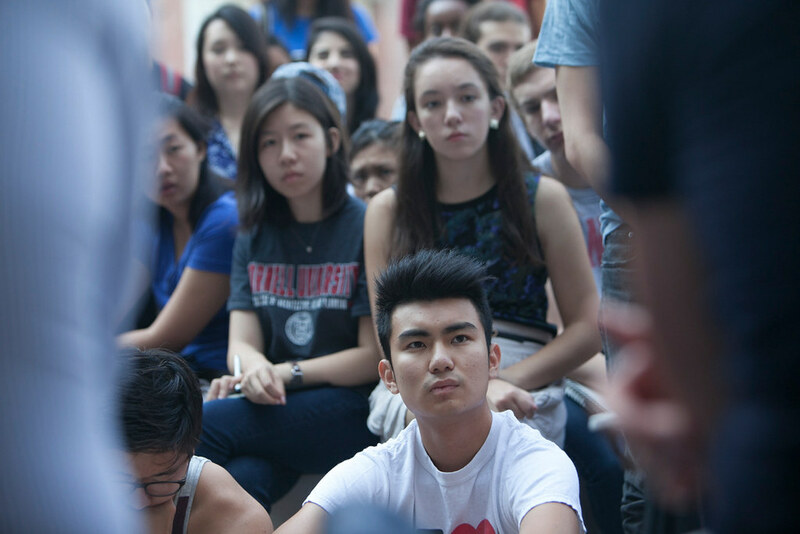 '00), on left, sits with Herzog in conversation with students at the Milstein Hall West Plaza. Students listening during the conversation between Hezog and Pajkic. Herzog makes a point during the gathering on the West Plaza. Herzog responds to student comments. Herzog and Pajkic. 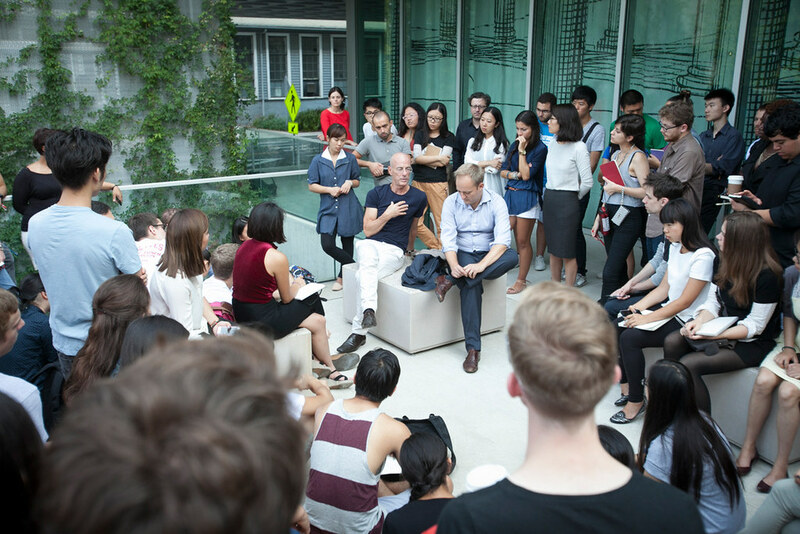 Herzog and Pajkic in conversation with students on Milstein Hall's West Plaza. Herzog gesturing during the conversation with students. Peter Eisenman (B.Arch. '55), during the afternoon discussion with Herzog. Herzog and Eisenman. 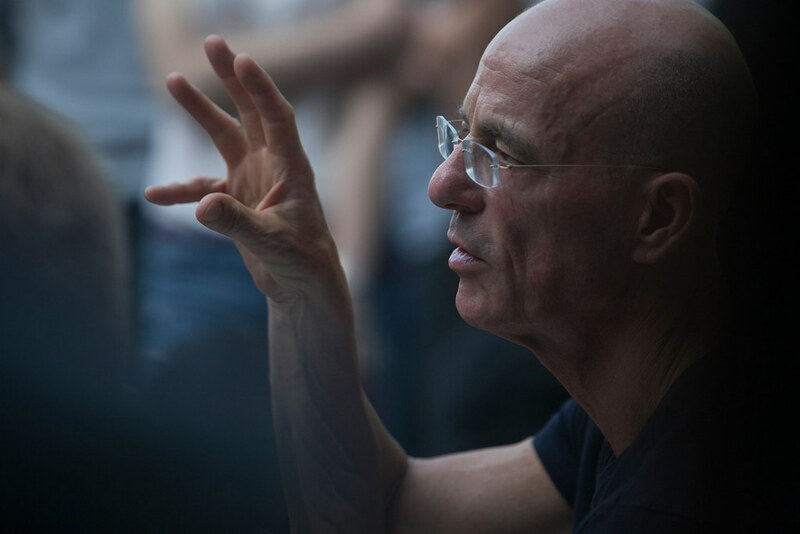 The work of Herzog & de Meuron concerns itself with human perception — it is about seeing, touching, and hearing. Their buildings privilege sensation and immediately reference a feeling, a mood, an event, a memory, a moment. Their work emerges from a careful observation of the behavior of human beings — how people act and what they do — and provokes an expanded understanding of the everyday, where each project is somehow familiar yet never fails to produce the unexpected. 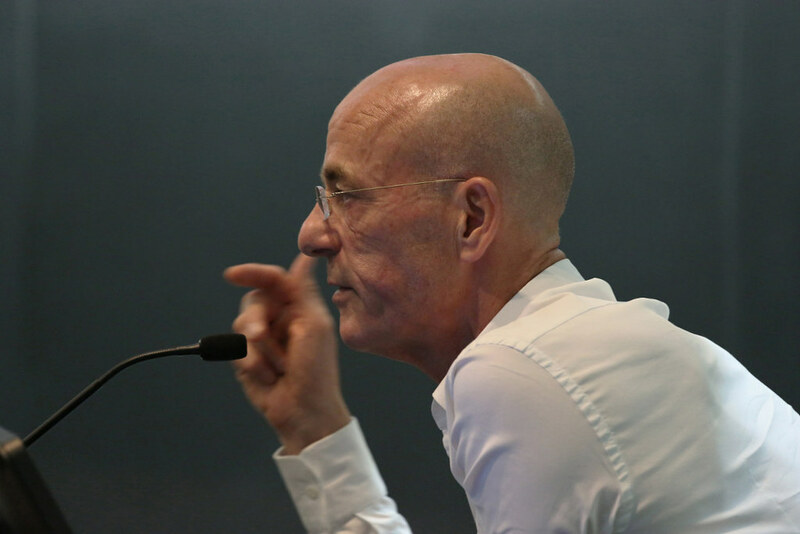 Herzog & de Meuron is a collaborative practice that maintains a rigorous commitment to conceptual clarity, where often simple and easily recognizable volumes are reimagined into programs, scales, and contexts for which they were never intended. Their provocative and unfamiliar usage of materials has from the beginning consistently altered our understandings of the role that materials play in an architectural work. It is this rich juxtaposition that combines multiple formal and material meanings into a single work, a work that refuses to remain static, where rainwater becomes painting, concrete becomes mirror. "It is the indissoluble bond between material and immaterial characteristics of architecture that attracts us and refuses to let go; it is that to which we submit ourselves like to a beloved body that takes us away for a moment into a magical world." 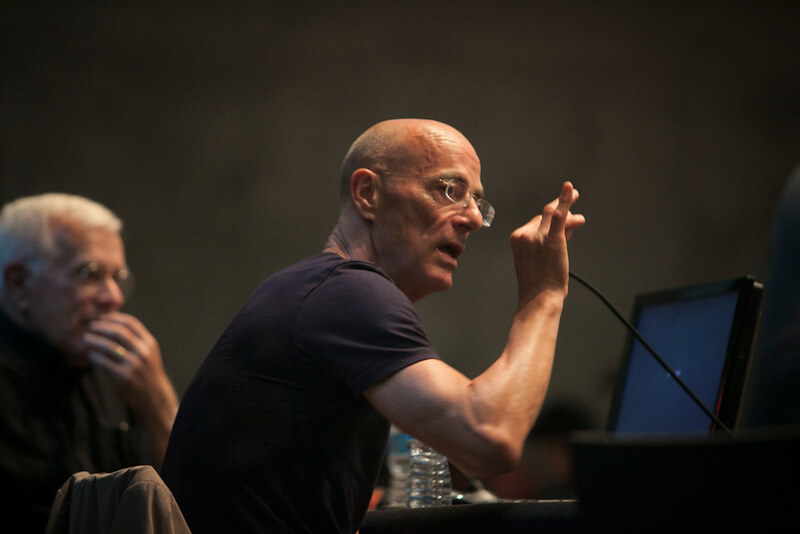 Jacques Herzog will consider the condition of architecture as the keynote speaker for the 2013 Preston H. Thomas Memorial Lecture. The two-day event will consist of a lecture, a conversation with students, and a panel discussion. 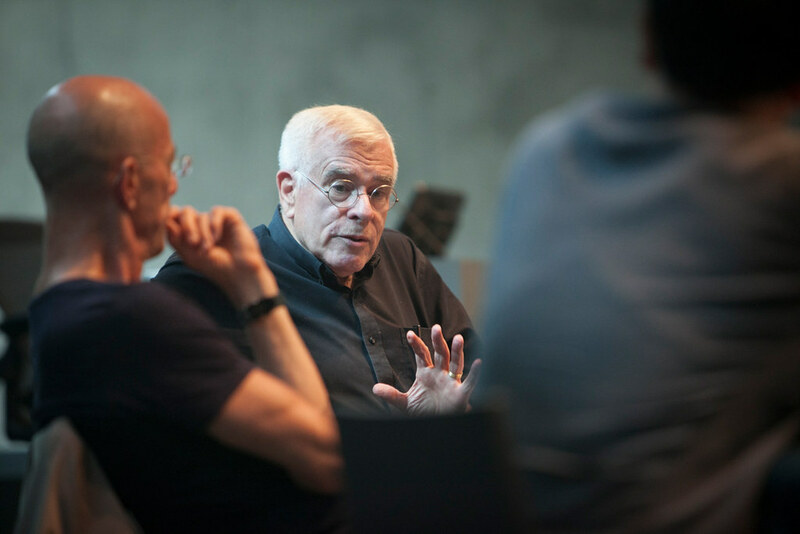 Herzog will be joined by Peter Eisenman (B.Arch '55) for the panel discussion, which will be moderated by Carson Chan (B.Arch. '04). The Preston H. Thomas Memorial Lecture Series is funded through a gift from Ruth and Leonard B. Thomas in memory of their son, Preston. 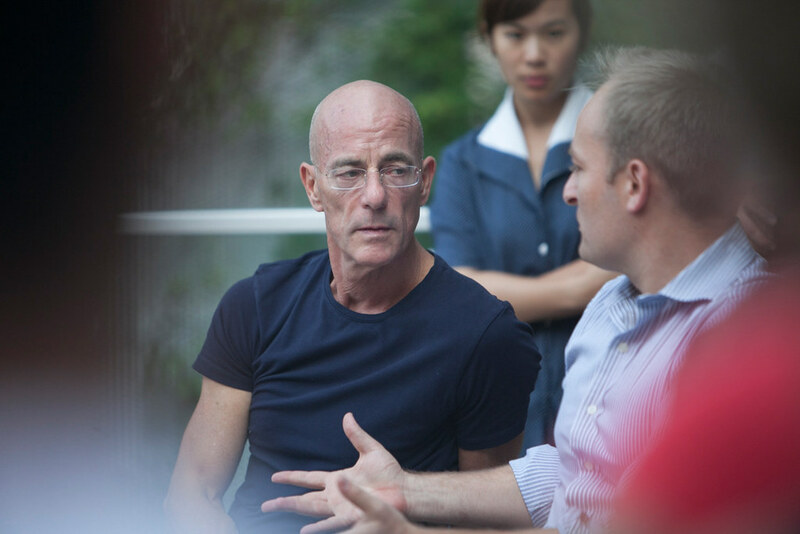 The event was organized by Associate Professor Andrea Simitch and Mia Miyoung Kang (M.Arch. '13).